Are you one of the millions of Americans who cited losing weight as one of their New Year’s resolutions? I hope you haven’t given up yet. One of the 2011 resolutions my husband and I made is to eat more healthfully (and by default, lose weight). Like most people, Dan and I are busy and find it hard enough to fit in exercise every day, let alone get a healthy meal on the table. So we’re working hard to plan easy healthy meals to help us meet our goals. I’ve found that the best tool in our kitchen to help us succeed in our efforts is our slow cooker. With just a little bit of prep in the morning, we can come home to a hearty, low-calorie meal that’s ready to eat. Our house smells pretty darn good too! 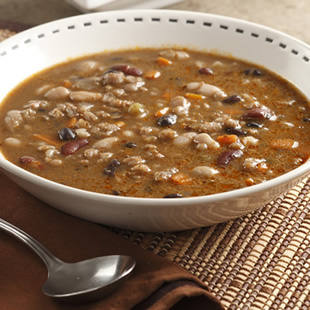 My new favorite slow-cooker recipe isSouthwestern Bean & Barley Soup. I cut up the veggies the night before while I’m making dinner so it takes only a few minutes to get in the slow cooker in the morning, plus it’s full of flavor and really satisfying. You can even make the soup mix in advance and stash it in jars in your pantry for emergency meals. The recipe makes 6 servings and the soup keeps for up to 3 days in the refrigerator so it’s great to bring along for lunch later in the week too. I like to serve it with lime wedges and a little chopped fresh cilantro on top and cheesy quesadillas on the side.